Looking for one of the best subscription boxes for female entrepreneurs? You just found it! Sparkle Hustle grow is an online community and monthly subscription box for busy entrepreneurs like you and me. Each month, they send a box full of items that are picked out especially for bloggers, online influencers, and freelancer. I’m a fan of these boxes as I’m sure you’ve already guessed after seeing this unboxing, and this one, and this one too. Want to see the March 2019 box? Here you go! Disclaimer: This post contains an affiliate link and I was given the Sparkle Hustle Grow Box for free but trust me, I only give my 100% honest opinions about products! Read here for more info. Get $5 OFF your first Sparkle Hustle Grow box here with the coupon code LINDSTROM. 1. Online Training: Group Coaching by Rachel Hollis. $67 value. I really love Rachel Hollis and the brand she’s built over on The Chic Site. If there’s a female entrepreneur out there who has seemingly found the balance of family + working mama, it’s her. This training is to help you make a lasting change, as well as to learn how to get further, faster. 2. Bluetooth Earbuds with Case by Bebe. $49.99 value. Score! I’m turning into an avid runner thanks to the fact that summer is almost here. These earbuds will be seeing my treadmill quite a bit over the next couple of months. I used to have wireless earbuds that I had purchased from TJMaxx and they were awful! I swear I’d have to charge them for hours and hours and then they’d only last about 30 minutes. These Bebe earbuds say they charge in about 2 hours and last about 3.5 hours. 3. Habit Tracker Sticky Note & Goal Tracker Sticky Note. $4.50 and $3.50 values, respectively. I’m the kind of person who has sticky notes EVERYWHERE. I love to use them because they’re an incredibly easy way to keep track of what’s on your to-do list without having rebel papers flying everywhere in your office. 4. Beaded Watercolor Bookmark by Peter Pauper Press. $2.95 value. You guys already know what a bookworm I am…I mean, I have a bookshelf on my site of all of my recommended books for bloggers and female entrepreneurs. This bookmark will be used a lot in my house! 5. Girl, Stop Apologizing: A Shame-Free Plan for Embracing and Achieving Your Goals by Rachel Hollis. $24.99 value. Yay, I am so excited this book was included in this month’s Sparkle Hustle Grow box! I was just recently in Target and I saw this on the shelves. I wasn’t willing to shell out the $25 for it because #cheapskate. I’m thrilled to open this one up and to start reading! Rachel Hollis’ point on page 124 about waking up earlier is really great. In the beginning of my blogging business, I woke up very early! And when I say early, I mean 4:30-5:00am during weekdays and 6:00-7:00am on the weekends. Sometimes you need to create the time in your life in order to work on your blogging business! Remember when I did a Day in the Life of a Blogger? I was still living by the rule of waking up early. You can watch it down below. Which product was your favorite from this month’s Sparkle Hustle Grow box? I’d have to say that I’m really excited about the earbuds and Rachel Hollis’ Girl, Stop Apologizing book! 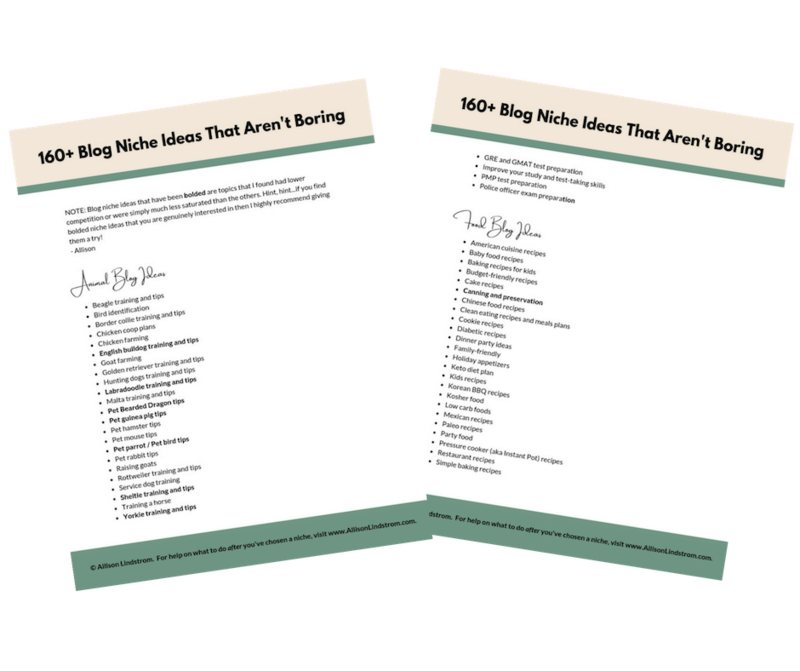 Want 160+ blog niche ideas that aren't boring? Use this list to find a blog topic that is more exciting (and more profitable!) than the typical "lifestyle blogger" niche. Send the list to my email! The list will show up in your email inbox within 15 minutes. Unsubscribe at any time.